I recently had the opportunity to chat with the lovely and talented Yvonne Lambert, multi-instrumentalist and front-woman for the Austin, TX based band The Octopus Project. Between touring and writing new music with the band, stitching together hand-made stuffed animals for their fan store, teaching theremin workshops, and doing demonstrations for kids' music camps, Yvonne Lambert is one busy woman! One thing in particular stood out as I talked with Yvonne – she's doing what she loves. Before going "full time" with the band, Yvonne worked in the field of music therapy, which seems incredibly fitting given her love of music and her passion for helping others. She worked with various patient populations ranging from adolescent boys to lower functioning adult groups with conditions such as Alzheimer's disease. Using exercises such as group jams with percussion instruments, tambourines, and autoharps she helped entertain and engage the minds of her patients. While Yvonne is no longer in the music therapy business, her work with The Octopus Project certainly entertains and engages the minds of their audience! Yvonne’s personal mission in the band is to demonstrate what the theremin is really capable of, and if you’ve heard her performance in songs such as "I Saw the Bright Shinies" (her favorite among the band's songs featuring the theremin), you'll know she’s on track. In this song, she alternates between single, double, and triple-dubbed theremin tracks which represent one lonely ghost searching for his friends. In live shows, she backs herself with a mellotron and synthesizer while playing the third part on her Etherwave Pro theremin. Yvonne's musical talents don't stop at the theremin. During performances, she takes turns on the synthesizer, guitar, and xylophone. But we're here to learn about her work with the theremin… so let's get on with it! TW: For those unfortunate souls who aren't familiar with The Octopus Project, how would you describe your music and your role in the band? YL: It's always hard to put the sound of The Octopus Project into words. I can only describe it as a loud and colorful rock/electronic hybrid. We started this band without any clear idea of what we were going to sound like. Our plan was to use every sound, instrument, prop, or toy we had within our grasp and make something new. The theremin was an obvious fit once we were able to get one. We all switch around and play various instruments within the band, sometimes these switches take place during a single song. I am the only lady in the band, but I'm not always the mama bird. As far as my role in the band... as far as any of our roles as band members, I think they change as often as we switch instruments. We take care of each other and see every song, record, tour, or challenge as another opportunity to play a new role. TW: How did you come to play the theremin? Did you discover it, or did it discover you? YL: I discovered the theremin after seeing the documentary, 'Theremin: An Electronic Odyssey.' Josh and I both fell in love with the history of the instrument and the story of Leon Theremin's life. We ordered an Etherwave Standard from Moog shortly after and I just happened to be the one of us who took to it. TW: What's your musical background? Are you formally trained in other instruments? YL: I am not formally trained in any instrument. As a child, I had a choice between ballet lessons and piano lessons. I chose ballet and it fostered an early obsession with classical music. My grandmother gave me an organ when I was 5. My earliest memories of playing music feature me as a 5 year old, trying to make up the "saddest" song in the world and making myself cry in the process. Later, I went on to pick out and play many of my favorite classical songs by ear. Beethoven, Chopin, and Mozart were my favorites. I do not have perfect pitch, by any means. I do, however, count myself as very fortunate to have a decent ear for pitch. It helps when playing the theremin! I even think that all of those years of studying ballet helped me to be a better thereminist. TW: How long have you been playing the theremin? YL: I started playing "with" the theremin in 1999. It wasn't until about 2003 that I decided I wanted to do the theremin justice and learn how to actually play. TW: How did you learn to play the theremin? YL: I taught myself to play the theremin by listening and playing along to slow-moving classical music (mostly Beethoven) and Zhou Xuan, a famous Chinese singer and actress of the 1940's. To me, the sound and movement of Zhou Xuan's voice are very theremin-like. TW: How long did you practice the theremin before you started using it in The Octopus Project and in live shows? YL: I was too excited about the new sounds and possibilities of the theremin to do much practicing in the beginning. I used the theremin in The Octopus Project right away! I had no idea what I was doing, but I knew I loved it. TW: How does the theremin factor into your songwriting with the band? YL: I think the theremin holds a special place in the band. We neither want to over nor under use it in our songs. I think it's important to try and keep it balanced with the other instruments we use, which are many. I also try and use it in a variety of way to keep it fresh and interesting. I'll use it dry or with a delay, play distinct melodies, demonstrate the crazy spacey sounds, record quadruple harmonies, etc. It may be the focus of a song or it might play a small incidental part. We are all aware of the "crowd pleasing" effect of the theremin. We occasionally meet people who come to our shows just to see the theremin played, so we never play a show without at least a few songs featuring theremin. TW: Have you had any particular challenges with the theremin in live shows? YL: We once played an outdoor show just off of a beach in Taiwan. It was hot, humid, and a little rainy. My theremin was in a backstage tent for most of the day. When I got up on stage to try and play, it was uncontrollable. I could only get a singular high pitched squeal out of it. Luckily, there was another thereminist on the bill and I was able to borrow one. To date, this has been the only time we have shared a bill with another band who has a theremin. I still cannot believe my luck that day! TW: Tell us about your stance - it's almost like you're steadying the theremin stand as you play. Is that something you do out of necessity with your particular setup, or just for comfort? YL: My stance started out as absolute necessity. I am in a band with 3 guys who stomp, move and thrash around when we play live shows. Sometimes I have to do everything I can to steady the theremin into a playable position. I always have my right foot on the stand to keep it steady. If I have to, I will even use my knee against the base of the instrument. I've learned to adjust my playing for shaky stages, rowdy crowds, tiny spaces, and thrashing band members. I sometimes play the theremin with my right foot on the stand even if I don't need to. It's comfortable. It makes me feel a little more in control. TW: We saw you performing on a Moog Etherwave Pro in Chapel Hill. Do you use any of the special features of this theremin in your performances (compared to the Etherwave Standard or other models)? Do you have a backup model now that the Pro is no longer being made? YL: I used the Etherwave Standard for years and loved it! Now that I have the Etherwave Pro, it is the only theremin I want to play. The only features of the Etherwave Pro that I use are 2 of the preset sounds. Otherwise, I use it in much the same way as I did the Standard. I tried using the tuner output on the Etherwave Pro in practice a couple of times and it didn't work for me. It was distracting. I prefer to feel what I am playing over seeing what I am playing. I trust my intuitive correctness over being able to physically see that I am on perfect pitch. I was lucky enough to find 2 Etherwave Pros, so I have a backup for my Pro. I hope to play them forever! TW: What other theremin models have you tried? What do you like in particular about the Etherwave Pro? YL: I tried a Paia kit theremin once but preferred the playability of the Etherwave Standard I was using at the time. I also had the opportunity to play a 1920's RCA theremin that was tenderly rebuilt by a genius friend of ours in Tuscon. I have no words for how it felt to play the RCA. It was beautiful. As far as what I like about the Etherwave Pro, I say everything. It's reliable, it's easy to tour with, and it plays and sounds like butter. TW: What tips would you give the aspiring thereminist? YL: I tell every aspiring thereminist to be patient with themselves, start by play along to slow-moving songs that they love, and to have fun with it! Well there you have it! A big Theremin World thanks to Yvonne Lambert for her time! 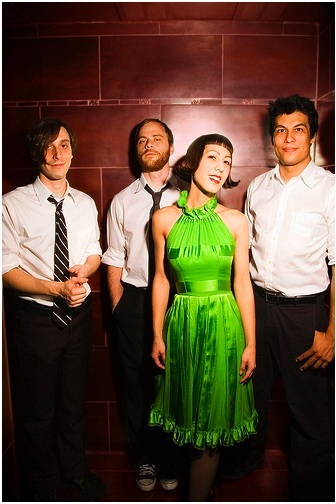 Be sure to check out The Octopus Project's website to learn more about the group and to hear Yvonne's theremin magic in action. You can also buy their albums directly from iTunes.